Looking to place a bet on a football match, but confused with the terms? This section will help you understand the types of bets that bookmakers typically offer. Learn what 1x2, Over/Under or Asian Handicap means and start making money today. What is “Draw No Bet”? Draw No Bet, often abbreviated as DNB, is a betting option, offered by many bookmakers, but it is also a betting strategy. This type of betting is very popular, especially in sports like football and rugby where three outcomes are possible. Draw No Bet means that betting on an event that ends with a draw, your stake will be returned. You will make no money, but you won't lose anything either. As you see in the diagram, we have Bayern Munich playing against Barcelona and you believe that Barcelona will win this. Therefore you place a 100€ on it. The odds are 2.8, meaning that if Barcelona wins indeed, you will get 280€. However, in the other two possible outcomes of the game, you lose it all. In the next scenario, we look at wagering the same 100€, but this time using Draw No Bet. The Barcelona DNB odds are lower, in this case 1.95, which means that if your team wins, you will only get 195€. However, if the game is a draw, the Draw No Bet betting option guarantees that you will get your 100€ back. Therefore, we see how Draw No Bet is a way to minimize risk. Many bookmakers are offering the DNB betting option, so it is worth exploring. DNB can be looked at more as a strategy in the cases when bookmakers do not offer the option or whenever the odds are not so favorable. It is only natural that bookmakers build in their overround into the Draw No Bet they offer. In some cases, it might be better for you to do some simple math and calculate the DNB odds yourself. Let's say you want to bet 100€ on Arsenal, playing against Liverpool. Below are the odds. The traditional strategy is to “cover” for the draw. Dividing 100€ by the 3.4 (odds of a draw), you find that if you bet 29.41€ on a draw, you will get exactly $100 should the game end without a winner. Hence, if you place $70.59 on the Arsenal win (100€ – 29.41€ = 70.59€), and 29.41€ on the draw, you will have an exact Draw No Bet type of bet. If Arsenal wins, you will earn 148.24€ (and not the 210€ you would have won with a simple Arsenal win bet), but should the match end with a draw, you would get back your 100€. If you were to use this option, you would get 150€ if Arsenal wins and keep your 100€ if the game is a draw. 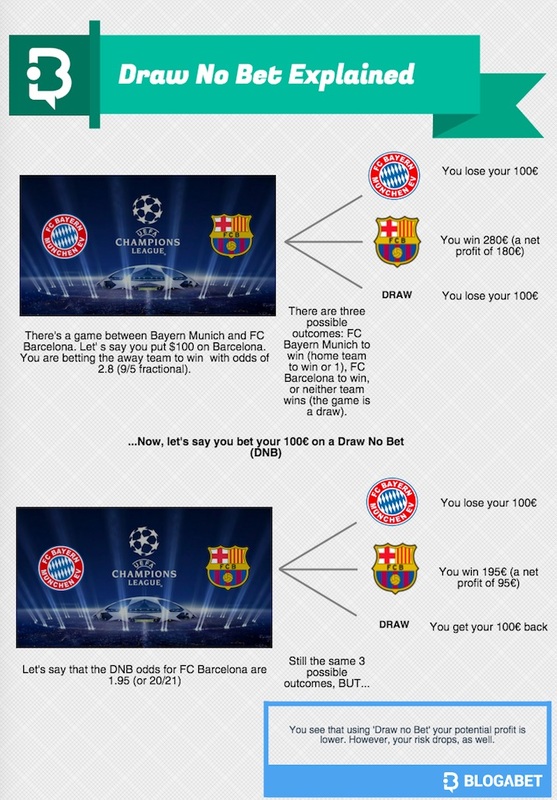 Comparing it with the calculation above, we see that you should take the DNB option bet365 offers, because it leaves you with a higher profit (150€ vs. 148.24€). Another way to create a DNB bet, if it is not being offered, is through placing an Asian handicap 0 (AH 0). In this particular case, we see that the odds are exactly the same, so placing a DNB or an Asian Handicap 0 will bring you the same profit. This is basically Draw No Bet explained in a nutshell. DNB is good options. In tennis, hockey, basketball betting only moneyline, 2 way is a good way. LoL... Dude said there is no value in DNB in the long run ... https://thesportsjudge.blogabet.com/pick/20773231/torino-fiorentina ... Define value there guy, because last I heard 2.32 is FULL OF VALUE! Go on with your day now, because you sir, are GUILTY of not knowing what you're talking about! ~Gavel Dropped! the best tipsters understand how value works, and what it means to put yourself in a position to get your bet refunded, is a good thing! Would YOUR BEST TIPSTERS rather Lose a 1x2, or Refund a DNB? Since I AM one of those better tipsters, and since I have been doing this for 30+ Years... I'll go with brains! Figure it out one day, and you'll become a better tipster yourself! Done here!